The Museum of Natural History has a number of facilitated programs available for visiting classes. Ranging in topics from Nova Scotia’s geology to First Peoples, we offer programs for most elementary grades. Our programs help provide an understanding of nature and science from a Nova Scotian perspective in an interactive setting. We use our galleries and unique collections to provide objects-based, student-centered learning, which offers an opportunity to learn in a way that is difficult to replicate in the classroom. A variety of artifacts, live animals, and museum quality reproductions complement each lesson, allowing for in depth observations and open-ended discussion. Each program is tailor-made to address specific curriculum outcomes found in the Atlantic Canada Curriculum and are led by dedicated and professional museum staff and volunteers. 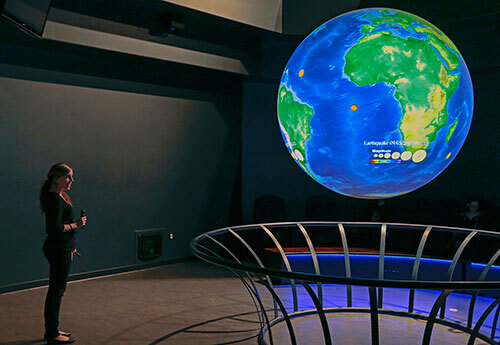 In addition to our facilitated programs, we also offer self-guided visits with the possibility of a facilitated presentation in the Our Amazing World Gallery, featuring Science on a Sphere! Teachers visit free and receive 10% off in the gift shop by showing appropriate ID. The Museum of Natural History is part of the Nova Scotia Museum. Visit the other museum websites to see their education program offerings. The Museum of Natural History is open on inservice days and is a great place to bring children when school is not open.